The new Starry crab. Image by Dr. Peter Ng and Dr. Ming-Shiou Jeng. 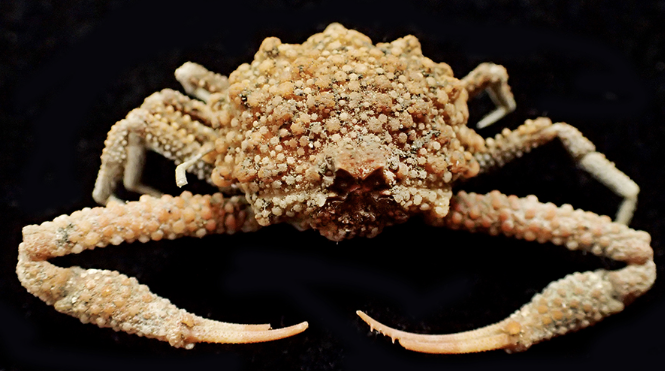 An unusual new species of crab has been found living in red coral beds in Taiwan. The crab has been given the name of Pariphiculus stellatus — 'stellatus' translates as ‘starry’ from the Latin, and refers to the pointy protrusions that cover the carapace and chelipeds of the crab, that researchers say are reminiscent of stars. These protrusions change with age, becoming shorter, blunter and mushroom shaped, to resemble warts. The new species was discovered during a survey at a small seamount by Peng-Chia-Yu Island, Taiwan. It has also been found in the Philippines.